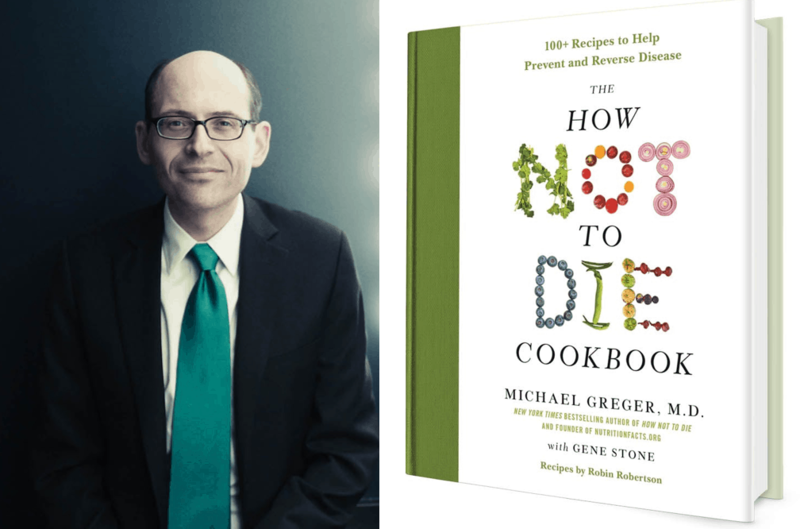 To celebrate the release of the How Not to Die Cookbook I thought it would be interesting review some of Dr Greger’s recipes to see how they stack up nutritionally. Firstly, I’ve got to give kudos on the layout. Rather than wait for a hard copy to ship to Australia, I bought my copy on Apple iBooks and was impressed at how you could interactively explode the ingredients list to full screen on my phone. This feature would be invaluable when actually using the book in the kitchen, especially on a phone where showing a full page of small text on a screen is impractical, and all you want to see is the ingredients from a distance. The recipes in the How Not to Die Cookbook are full of nutritious minimally processed whole food, which is a win for me. There are heaps of colour on the pages, which is indicative of the range of vitamins and minerals present in these minimally processed foods. In the introduction, Dr Greger makes the critical distinction between a vegetarian diet (which could be filled with highly processed grains and sugars) and minimally processed plant-based whole foods. Most of the issues with nutrition come when we overly process our food and make it shelf stable for increased profit margins. Some of the recipes in the How Not To Die Cookbook call for some whole wheat bread, pasta, date sugar and the like, but generlaly, the recipes rely on minimally processed whole foods. If you want quick and easy, this may not be the book for you. Although there are headings of ‘easy’ and ‘moderate’ on the recipes, most of the recipes have a significant number of ingredients, including a range of herbs and spices. You may have to gear up your kitchen with a range of new ingredients if you are not already following this way of eating. However, for the experienced WFPB enthusiast who wants to add some flair and variety to their diet and dinner parties, this book is ideal. In spite of being the Director of Public Health and Animal Agriculture for the Humane Society by day, Dr Greger doesn’t overtly focus on being vegan or vegetarian in the book. Unlike many others in this field, he doesn’t lead with animal welfare as the primary basis for his dietary appraoch. In the introduction to the cookbook, he talks about his personal experience of seeing his grandmother’s life turned around by this way, under the guidance of Nathan Pritikin (pictured below). Greger is a self-confessed “nutrition nerd” who appears to find genuine excitement in unpacking the research to find links between different aspects of diet and their impact on health. His Nutrition Facts YouTube channel has become viral and has become the primary resource for pre-processed nutritional inspiration for many. Nutrition is still an emerging science. We seem to still be fumbling trying to understand the mechanisms, the cause and effect relationships of the food we eat on our health, well-being and longevity. To deal with complexities of a topic like nutrition, we adopt a simplified frame of reference to help us navigate our reality without our mind exploding. These simplified frames of reference are never perfect. It’s also hard one frame of reference that explains everything perfectly. Over time we strive to create new and more useful frames of reference that suits use best. The Paleo frame of reference says we should eat foods that we evolved with. The vegan frame of reference says we should eat foods that don’t harm other sentient life forms. The cost frame of reference optimises for the lowest cost per calorie with minimal consideration of nutrition. The Heart Association frame of reference believes that minimising fat, especially saturated fat, will help us avoid heart disease. The conservationist frame of reference tries to eat in a way that we should eat in a way the minimise our impact on the environment. The Seventh Day Adventist Church (who have a large influence through their food companies and medical evangelism) believe that they should eat plants and herbs (and not meat) because that’s how it was in the Garden of Eden. The low carb/keto frame of reference suggests that minimising carbohydrates and maximising fat will lead to optimum health for most people. As a doctor, Dr Greger relies on the medical research frame of reference. He draws associations between different food properties and health outcomes and tries to develop a system that avoids the qualities of food that he believes to be dangerous. While some people suggest that Greger cherry picks the studies and interprets the data to fit his plant-based perspective, the research-based frame of reference is at least a refreshing contrast to the fear-based frame of reference in more militant vegan presentations (e.g. What the Health and Cowspiracy). While I don’t call myself a Nutritarian, my frame of reference has a lot in common with Dr Joel Fuhrman’s focus on nutrient density. Rather than focusing on foods to avoid I think we need to focus on foods that contain the nutrients we need. By focusing on the things we need we automatically eliminate the things that aren’t good for us in excess. Ultimately, I think we should focus on eating the foods that give us the nutrients without having to ingest too much energy to get those nutrients. Dr Mat Lalonde’s take on nutrient density has also been a major inspiration. Lalonde took Fuhrman’s ANDI and re-ran the analysis to consider only essential vitamins, vitamins, amino acids and essential fatty acids for which there are widely available data and some consensus on the minimum nutrient intakes. The problem with Lalonde’s approach, though, is that amino acids are very easy to find in our food system, so the system ends up optimising for very high protein foods at the expensive of vitamins and minerals which can be harder to obtain in our food system. Dr Greger is also a big fan of nutrient density as shown in this NutritionFacts.org video. Rather than emphasising all nutrients, the Nutrient Optimiser algorithm identifies the nutrients that you are not getting in large quantities and identifies foods that will boost those nutrients. If you want to follow a particular dietary template (e.g. vegan, paleo, ketogenic, low carb, whole food plant based, pescetarian, vegetarian, bivalve vegan etc) the Nutrient Optimiser algorithm can work within those parameters to identify the most nutrient-dense foods. However, the optimal nutritional outcome tends to be to simply focus on the most nutrient-dense foods available. As the husband of someone who has had type 1 diabetes for three decades, I also see the importance of eating food that doesn’t require massive amounts of insulin to maintain normal healthy blood sugar levels. There is value in managing dietary insulin load to make sure you don’t need massive levels of insulin to stabilise your blood sugar. The food insulin index data shows us that our glucose response is proportional to the carbohydrate we eat. While our insulin response is related to the non-fibre carbohydrates minus about half the fibre. And lastly, energy density can be a useful tool to help you moderate your food intake. This is another area where the WFPB approach shines in contrast to the low carb or ketogenic approaches, which can be energy dense and make it possible to overeat. Without the use of added oils or a significant amount of processed grains and sugars, it will be practically impossible to overeat using only the meals set out in the How Not to Die Cookbook. I chose representative meals from the various sections of the book. If you click on the recipes listed below, you will see the meal entries in Cronometer. If you want the photos and directions, you’ll have to buy the book). The figure below shows the nutrient profile of Dr Greger’s recipes in terms of nutrients provided as a proportion of the recommended daily intake. As you might expect, we get a ton of vitamin K1, vitamin A and vitamin C. However, at the top of the chart, we’re not meeting the DRI levels of vitamin D and vitamin B12. The Nutrient Score is a relative comparison of the quantity of essential nutrients in our food. If your diet provides twice the minimum level of nutrients, then we would achieve a perfect score of 100%. This approach doesn’t reward massive amount of a small number of nutrients, but rather leads people to rebalance their diet so they can obtain a substantial intake of all the essential nutrients. In his Perfect Health Diet, Paul Jaminet notes that “a nourishing, balanced diet that provides all the required nutrients in the right proportions is the key to eliminating hunger and minimising appetite and eliminating hunger at minimal caloric intake.” Similarly, studies by Dr Joel Fuhrman indicate that a nutrient dense diet will reduce cravings and provide satiety with a lower energy intake. Overall, the recipes from the How Not to Die Cookbook get a respectable Nutrient Density Score of a score of 79%. For comparison, the lowest Nutrient Density score is 20% while the highest score to date has been 92%. The macronutrient split of the recipes is shown in the chart below. While these foods are 70% carbohydrates, there are only 54% non-fibre carbohydrates once we subtract the fibre. As shown in the chart below of nutrient density score vs non-fibre carbohydrates (see this article for more detail), we can get a reasonable amount of nutrition with net carbs anywhere in the range of 0 to around 60%. So, while not optimal, this level of non-carbohydrates in Dr Greger’s meals is not excessive for most people. However if you already have diabetes it will likely not provide optimal blood sugar control. Similarly with fat at 14%, we’re still within an acceptable macronutrient range, although optimal nutrient density seems to align with around 40% fat. For the sake of analysis, I have run the Nutrient Optimiser report for a male who is 80 kg (176 lbs) with 15% body fat to achieve a maintenance energy intake of 2000 calories per day. Dr Greger’s recipes provide on average 84 g of protein per day which equates to 1.2 g/kg lean body mass (LBM) or 1.05 g/kg total body mass per day. Optimal protein is a contentious topic. However, we can say that the intake level provided by Dr Gregor’s meals would exceed the Adequate Intake level of 0.86 g/kg and is about equivalent to the recommended daily intake. Where things get murky is when we talk about the bioavailability of plant-based protein versus animal protein; however, Dr Gregor generally appears more concerned about not getting too much “animal protein” for longevity considerations. I’m not aware of any research in humans that demonstrates that we live longer by reducing protein intake. There is research in yeast and worm that shows that energy restriction and protein restriction causes slower growth and overall longevity, though the quality of life may be compromised. What appears clear is that having more lean muscle mass and lower levels of body fat is a good thing. To optimise your health and longevity you need to find the balance between excess growth and obesity versus being too frail and weak to be resilient as we age. If you are lifting heavy and trying to build muscle, you may benefit from consuming at least 1.8g/kg total body weight. And if you are dieting and trying to lose body fat, then it seems to be beneficial to have anywhere between 1.4g/kg total body weight (for a moderate energy deficit) and up to 2.6g/kg body weight (for a very aggressive energy deficit) if you want to preserve your lean muscle mass. Insulin load is the amount of the food in your diet that will require insulin to process due to the non-fibre carbs and protein. This video from Dr Greger was one of the things that got me thinking about insulin load there three years ago and trying to put the pieces to. While having plenty of vitamins and minerals (particularly potassium, calcium, magnesium and sodium) from whole foods helps to improve blood sugar control by improving insulin sensitivity, so does lower levels of processed carbohydrates that tend to raise blood sugar levels. Dr Greger’s diet would provide an insulin load of around 341g per day with 67% insulinogenic calories. For those of you that are used to thinking in terms of carbohydrates, this is 294g per day of non-fibre carbohydrates. Insulin load is actually quite closely correlated with nutrient density. While 67% insulinogenic calories is just inside the nutrient density envelope, such a high insulin load would be a problem for someone like my wife Monica who has Type 1 diabetes. As discussed in the vegan vs keto for diabetes article, a whole food diet can provide benefits in terms of higher levels of beneficial nutrients to help with insulin sensitivity and generally means people eat less due to a lower energy density of fruit and vegetables, it seems to be the people on a reduced carbohydrate higher protein approach that has the best diabetes control. Optimal nutrient density appears to align with an around 40% insulinogenic calories. People who are already insulin resistant or who have diabetes should work to reduce the insulin load of their diet to the point that they can achieve stable blood sugar levels. It is harder for someone not consuming any animal products or seafood to reduce their insulin load. However, we will look at how someone following a WFPB diet can minimise their insulin load as much as possible. While I’m a proponent of getting adequate protein, I also think getting adequate minerals is critical to metabolic health, as well as muscle building. Some believe that avoidance of animal products is the most important parameter. However, I think one of the major benefits of a WFPB approach over a grain-based diet (or even a typical ketogenic or low carb diet managing diabetes) is the fact that it gives you plenty of alkalising minerals, which serves to reverse metabolic acidosis which leads to diabetes. The table below shows the nutrient balance ratios of Dr Greger’s recipes. It seems there are lower levels of zinc and higher levels of copper, which is a concern. The potassium : sodium ratio is above 2 which is great. However, I would have expected this to be higher given that Dr Greger actively avoids salt. The iron : copper ratio is high due to higher levels of copper from the plant-based diet. The calcium : phosphorus ratio is low due to the lower levels of calcium and higher levels of phosphorous. Omega 6 : Omega 3 2.1 < 4 Omega 6 : Omega 3 ratio is good. Zinc : Copper 3 8 – 12 Zinc : Copper ratio is outside limits. Calcium : Magnesium 1.8 < 2 calcium : magnesium ratio is good. Iron : Copper 8 10 – 15 iron : copper ratio is within range. Calcium : Phosphorus 0.9 > 1.3 calcium : phosphorus ratio is low. The aim of the Nutrient Optimiser is to help you rebalance your nutrients at a micronutrient level by identifying foods that will provide more of the nutrients that you are currently not getting in large quantities. The table below lists the nutrients that someone following Dr Greger’s diet would be getting less of relative to the other nutrients. The right-hand column indicates whether we want to prioritise these nutrients. While six of the thirteen less-available nutrients are amino acids, we will only prioritise the vitamins and minerals, given that Dr Greger has a range of videos warning of the perils of “excess” animal protein. The image below shows the plant-based foods that would provide the nutrients that are not being provided in large quantities by Dr Greger’s meals. The food shaded in light green are vegetables, the foods in dark green are spices, brown ad nuts and seeds, grey are oils and pink are fruits. Meanwhile, the image below shows the foods that would provide the harder to find nutrients without the plant-based constraint. In this table, the cells shaded green are seafood, red is offal, blue is dairy. What I find fascinating here is that even though we did not prioritise any amino acids or essential fatty acids, the Nutrient Optimiser algorithm seems to rebalance the diet with more protein (50%), more fat (35%) and less non-fibre carbs (3%). Meanwhile, if we were trying to manage diabetes and insulin resistance, these are the foods that the Nutrient Optimiser algorithm would recommend to manage insulin load while also being nutrient dense and filling in the nutrient gaps in Dr Greger’s meal while also remaining plant-based. If we weren’t trying to avoid animal products, the foods listed below would provide the harder to find nutrients required with a lower insulin load. It’s interesting that the system prioritised butter, cream and cheese to help reduce insulin load and rebalance micronutrients in Dr Greger’s recipes. Most of the time when I have run the analysis for people following a low carb diet the system recommends much more nutrient-packed green veggies that are often neglected by people following a low carb or keto diet. It’s interesting to see that for someone follow Dr Greger’s recipies it would recommend the opposite. Where this gets really cool is when we use the same process to identify meals to boost the harder to find micronutrients. The list below shows a selection of meals identified by the Nutrient Optimiser algorithm to fill the micronutrient gaps in Dr Greger’s meal plan. The chart below shows the nutrients provided by these meals. Compared to the 78% provided by the meals from the How Not to Die Cookbook, these meals from the Nutrient Optimiser would provide an almost perfect score of 99%! The higher nutrient density provided by these meals will mean that you would need to consume less energy to get the nutrients you need, while also improving insulin resistance, mitochondrial function and overall energy levels with the higher levels of essential and nonessential nutrients from whole foods. If you’re interested, you can read Dr Greger’s full Nutrient Optimiser report here. The recipes in the How Not to Die Cookbook are nutritious while remaining whole food plant based. The protein content meets the recommended minimum intake levels. However, higher protein levels may be required to maximise muscle protein synthesis for someone who is active or wanting to maintain lean muscle mass while losing body fat. The meals are relatively low fat but relatively high in non-fibre carbohydrate. While this level of carbohydrate is not excessive for someone who is metabolically healthy, someone who has diabetes may benefit from foods with a lower insulin load while also still maximising the nutrients that are provided by non-starchy vegetables. We can use the Nutrient Optimiser algorithm to identify foods that contain more of these harder to find nutrients regardless of our preferred nutritional constraints. Excellent article, except, for me, for the gaps mentioned below. Would you please explain the color coding in the bar graphs? similar improvements are needed, for me, for some of the other graphs. Without knowing which colors designate good/better/best foods vs. ok/bad/worse/worst, it is impossible to interpret and apply your bar graphs. Thank you for all your hard work for your readers. Sorry, I meant the colors on the charts of optimal foods, not the bar graphs. Is there someplace I missed where the color coding is specified?. Thanks Joe. That was the aim. Nice summary, well sourced. Dr.Greger’s book has been on the to-read list for a while and now it’s definitely getting a priority boost. Thank you for the thoughtful, well written review of this book. I’ve been thinking of purchasing, and your material helped with a more informed decision. I appreciate the amount of effort that went into the article! Thank you for this extensive review! While micronutrients such as Vitamin D and B12 are almost absent in his recipes, Dr. Greger recommends taking supplements of aforementioned vitamins (2000 IU daily and 250 mcg daily, respectively) in his How Not to Die book.